Bud Comte, 86, of David City, died Thursday, June 29, 2017, at the Butler County Healthcare Center in David City. Funeral Service Monday, July 3, 2017 10:30 A.M.
Albert Frank “Bud” Comte was born June 4, 1931, in Springfield, Nebraska to parents Albert A. and Ada (Stratman) Comte, and two sisters, Virginia (Comte) Buskirk, and Ada Comte. Bud attended Springfield Elementary, Jr. and Sr. High where he enjoyed playing basketball and baseball, as well as playing drums in his family trio band for many school functions. He graduated in 1948. After high school, Bud moved to David City and began working at Hinky Dinky grocery store in the meat department before leaving to serve his country and the Korean War as supplies manager with the SCARWAFF division of the United States Army from 1950 to 1952. Following his tour of duty, Bud returned to David City, and continued working in the grocery business, as well as starting up a small combo band called Dinky Doos, which played for many local fund raising events. In 1954, Bud was married to Patsy Ann Davis of Weston, Nebraska. To this 35 year union, 4 children were born, Roger, Ryan, Renee and Rick. 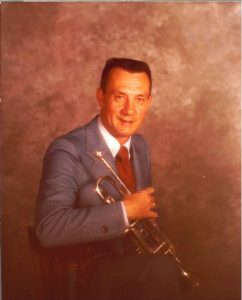 In 1955, Bud began working for Wright Feed Mill as a feed salesman, and started a 9-piece musical group called, “The Bud Comte Orchestra,” which entertained dance crowds for 30 years over a 7 state area until its retirement on December 31, 1985. Bud’s love for the feed business and music business continued to grow, and in 1962, he became the new owner of Wright Feed Mill with partner Dale Keller, and started dabbling in the music recording business with a small recording studio in his basement. In 1966, the Comte garage was converted into a more sophisticated recording studio and took the name “Renee Sound Studio.” Bud continued serving his community with the feed business and music business. The studio went to work immediately recording demos and albums for many bands in all genres of music from country to polka to big band and rock. Local schools and college groups used the studio to record sound effects and other special musical extras for theater productions. Many high school students recorded speeches, vocal and instrumental solos, duets and small ensemble pieces for All State and Girl’s and Boy’s State audition submissions, and every Bud Comte Orchestra album was recorded in Bud’s own studio. For 19 years, the Comte family garage served the many recording needs of Butler County and other communities, before it outgrew its space and was moved to one-time art studio Floyd Nichols’ where it continues today. The feed mill also outgrew its space and in 1987 moved to its new state-of-the-art feed mill, Five Star Feed. The Comte family business run by Bud and sons Roger and Ryan continued its service to the community until 2015. During his time in the feed business, Bud was very involved with the poultry industry, which was a key factor in the development of the egg houses and Henningson Foods Company in the Butler County area. In 1991, Bud was married to Patricia Shorney. Throughout Bud’s life, he has received numerous honors for his music, being inducted into the Nebraska Country, Polka, and Rock and Roll Halls of Fame. He has received numerous honors in the feed and egg industry, including Poultry Man of the Year, two times. He received the Ruth Etting Award in 1994, as well as other numerous awards and recognitions for his involvement in the community. He was a member of the Masonic Lodge, VFW and both the David City Public and Aquinas Catholic Boosters. Bud loved the people of the community and was proud to call David City, Nebraska his home. Bud was preceded in death by his parents Albert A. and Ada (Stratman) Comte; two sisters, Ada Comte and Virginia (Buskirk) Comte; brother-in-law Donald Buskirk; and mother of his children, Patsy Ann (Davis) Comte. He is survived by his wife Patricia (Shorney) of David City; children, Roger and Tami (Heitzmen) of David City; Ryan and Crysti (Wolfgram) of Columbus; Renee and Mick Kovar of Lincoln; and Rick and Pam (Koehn) of David City; grandchildren Stephanie and Tanner Goodrich of Chattanooga, Tennesee, Brian Comte of Lincoln, Christy and Nate Palensky of David City, Gabrielle Comte of David City, Megan and Devan Connealy of Lincoln, Adam and Brittney (Ernesti) of Lincoln, Alex, Nick and Brenden Comte of Lincoln; Madelaine, Isabella and Jacqueline Comte of David City; 7 great-grandchildren Hudson, Sonora and Avalon Goodrich of Chattanooga, Tennessee; Brinley and Alyssa Palensky of David City, and Ryan and Aubree Connealy of Lincoln; nieces and nephews, step-children Daniel and Rhonda (Mulholland) Juranek of Wahoo, Brenda and Brian Corbett of Thornton, Colorado; Barbara and Jeffery Vanek of Prague; Scott and Tracy Juranek of Nebraska City; Cathy and Mark Verbeck of Syracuse; step-grandchildren Jonus Juranek, Joshua Corbett, Brianne Corbett, Travis and Ashlie Vanek, Amber and Jordon Kavan, Brooke Vanek, Haley Vanek, Tanner Juranek, Courteney Juranek, Katelyn Holguin, Brittney Holguin, Arianna Holguin, Logan, Kaila, Sage, Sierra and Aiden Verbeck, step-great-grandchildren Carter and Taylor Corbett, Bryson and Brynlee Vanek, Emma, Easton, Eli and Even Kavan, Amora and Ronnie Romero.